Eugenia Psyllid (Trioza eugeniae), was introduced into California from Australia in 1988. Initially, it was so pervasive that people were removing eugenias from the landscape because of psyllid infestation. Eventually, a parasitic wasp was introduced to provide a biological control, which seems to have reduced Eugenia psyllid damage to a tolerable level. Psyllid populations are highest during winter and spring, when they attack the flush of new growth. The bumps you see on the leaves are feeding pits formed by the nymph stage of the psyllid. If you look closely, you may see tiny golden eggs laid along the edges of the leaves so there are several generation in play on the leaves. 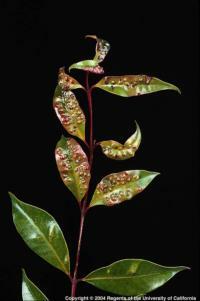 Regular shearing of new growth to remove psyllid eggs and nymphs, in combination with parasitic wasp conservation can be effective in managing psyllids infesting eugenia. The use of pesticides kills the parasitic wasps as well as the psyllids, which may result in a wasp population too low to control the damage. See close up photos of the Eugenia psylllid. Read more about management of the Eugenia psyllid.